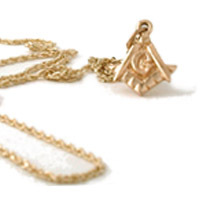 14K Yellow Gold is the industry standard for fine quality jewelry. It has a soft golden tone and a good weight, and good durability. These rings all have a solid back and can weigh around 14 grams, depending upon size. Brother Drew, My ring arrived last week and I am one happy customer. 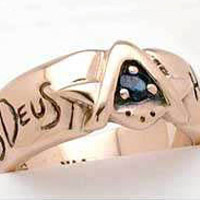 I wanted a ring that was not off the shelf or out of a catalog, but something more personal and distinctive. Your ring is just what I was seeking; I can not thank you enough. The ring is beautiful. The weight of the ring is excellent. I will wear this with pride for the rest of my life. Brother Jay P.S. I can't wait to show it off to my brothers in the lodge tonight. Brother Drew, Michèle just presented me with the ring and I was blown away. This ring is truly remarkable for its outstanding beauty. It is an original, handcrafted work of art. 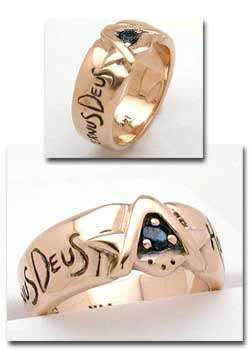 Unlike the mass produced clones one sees in all the catalogs, this ring accurately reflects the soul of our craft. I only wear two pieces of jewelry... my wedding ring and now my Brotherhood PM ring. Thank you for the personal care...I\'m sure you will be even more successful with your art in the coming years. S&F, Harry M, P. M.